Hello everyone! We have some exciting news!! 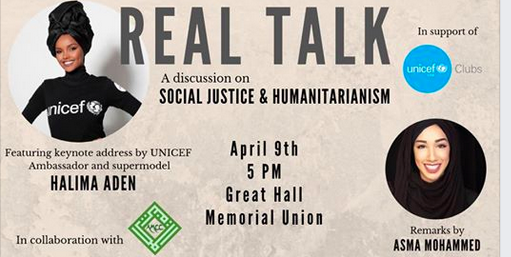 UNICEF at the U, in collaboration with AMCC, is proud to announce that we will be hosting the first ever “Real Talk” featuring UNICEF Ambassador and supermodel Halima Aden, in addition to social justice advocate, Asma Mohammed! Come join us on Tuesday, April 9th at 5 pm in the Great Hall at Coffman Memorial Union to be part of the discussion on social justice and humanitarianism! The event is completely free and open to the public, simply RSVP! Refreshments will also be provided, so make sure to tell your friends and families about this awesome event- you won’t want to miss it! !